Like a lot of Democrats — of which he is, strictly speaking, not one — Bernie Sanders still hasn’t gotten over the 2016 presidential election. In Sanders’ case, it’s because deep down he’s convinced that he could have won had he been the nominee. With Hillary Clinton’s loss, Sanders certainly has a strong case to make about his vision for the future of the Democratic party. There’s no question that Sanders is preparing for a presidential run in 2020. Given the low opinion in which Sanders holds the Democratic party establishment, that statement is all but a declaration of his candidacy. The question is whether he really is the best candidate to beat Trump. Sanders certainly has a lot going for him. His image is a kind of lefty equivalent of Trump (except authentic). Instead of a slick, groomed politician speaking in carefully tailored soundbites, Sanders is a rumpled, wild-haired, New York-accented politician who openly expresses the anger with a system that stacks the odds against most Americans. Sanders has had a lot of success pulling the Democrats in his direction. Medicare for all, forgiveness of college debt, addressing income inequality — what were once fringe ideas in the Democratic party are now standard order for candidates thanks to Sanders. But that may be bad news for Sander’s candidacy. His signature issues are no longer just his. Other Democrats, like Elizabeth Warren, are already positioning themselves in what was once Sanders’ lane. 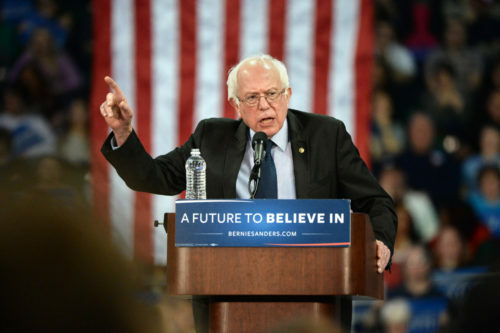 Sanders’ presidential hopes face other obstacles. For one thing, he’ll be 79 years old on Election Day 2020. For another, he’s made a number of enemies among Democrats who don’t share his willingness to trash the party establishment as forever beholden to money. For all his years in Congress, he has very modest legislative accomplishments. His track record of getting candidates like himself elected is mixed: okay in the midterms, but pretty poor in the primaries leading up to it. Moreover, many Republicans would love the idea of running against an actual socialist. As contentious as the 2016 presidential primary was, Clinton was relatively restrained in going after Sanders, never running negative ads. (Not that she pulled punches in their debates.) Republicans would more than compensate for that gap. Moreover, Trump’s tin-foil hat conspiracists and bigots would go bananas about a Jewish socialist running for president. As for the LGBTQ community, Sanders has been a reliable ally. But one of the key differences that emerged between Clinton and Sanders in 2016 is how differently they viewed identity politics. Clinton was all in on the idea and went out of her way to court the LGBTQ vote, having made major pro-LGBTQ policy changes as Secretary of State. In an especially tone-deaf statement, Sanders himself complained that HRC was part of “the political establishment” that he was battling. While there’s plenty of reason to criticize HRC, for better or worse it remains the largest LGBTQ organization in the country, and lots of voters that Bernie would like in his corner do support it. Sanders could be just one of more than a dozen candidates seeking the Democratic presidential nomination. Most of them will be jockeying for LGBTQ votes directly, not as part of a broader movement against the oligarchy. Perhaps Sanders may be able to ride his name recognition to success. But he may also find out that rejecting identity politics in today’s Democratic party is a ticket to a dead end.